Eric Ho is employing the latest in DNA sequencing technology to uncover more effective treatments for Lyme disease and breast cancer. 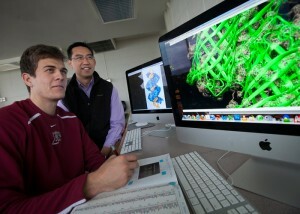 Lafayette’s first computational biologist, Ho not only shares his research while teaching classes in biomedical science, he also enables students to take an active part in his cutting-edge work using Next Generation Sequencing (NGS), where a single test can potentially identify thousands—even millions—of genetic variants carried by a single individual. 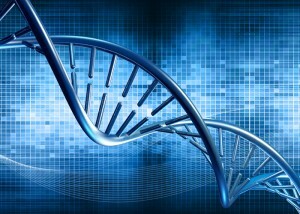 “Today’s biology is an interdisciplinary science in which mathematics, physics, and computer science are highly relevant to major biological discoveries in recent decades, such as the sequencing of the human genome,” says Ho, assistant professor of biology. He’s been working with students on two NGS-related projects that have the potential to provide a more precise picture of the mutation profile of cancer tissue and the genetic variations of the bacterial strains that cause Lyme disease, the most common tickborne disease in North America. Ho’s research is particularly relevant in Pennsylvania, which has one of the highest rates of infection in the country. Maureen Carey ’14 partnered with Ho to study the molecular pathways affected by Lyme disease infection in mice. She also collaborated with biology professor Robert Kurt on data collection before she and Ho crunched the numbers using computational and statistical methods. A biology graduate, Carey is now pursuing a Ph.D. in infectious diseases at the University of Virginia. Richard Tillquist ’14 assisted Ho last year in building a software simulator to study DNA sequencing technologies within parameters such as error rates and genome composition. They presented their work at the 90th annual meeting of the Pennsylvania Academy of Science and the Great Lakes Bioinformatics Conference. Tillquist, a computer science and mathematics graduate, is pursuing a Ph.D. in quantitative biology at the University of Colorado, Boulder. Ho also worked with electrical and computer engineering major Gregory Flynn ’17 (Surrey, United Kingdom) over the summer to build a website that hosts genomic information on the crop-devastating begomovirus. Flynn helped build the website from scratch as the first centralized resource for researchers studying the virus. About 300,000 new cases of Lyme disease are diagnosed in the U.S. each year with the majority of confirmed reports coming from the Northeast, Mid-Atlantic and Upper Midwest regions, according to the Center for Disease Control.